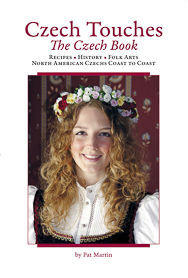 This book celebrates Czech culture, history, and traditional foods and recipes. You’ll find information about Czechoslovakia and the Czech Republic, as well as historic sites and museums in Prague. The National Czech & Slovak Museum & Library in Cedar Rapids, Iowa, celebrates the Czech and Slovak heritage with exhibits and historic relics and papers. The museum flooded in 2008, and photos of the museum’s monumental move are shown. Also included: Czech traditions, festivals and queen contests, folk costumes, marionette theater, the legend of St. Nicholas, United Moravian Societies, glassware, museums, music, and restaurants. Recipes include ones for Meats and Main Dishes; Soups and Stews; Mushrooms, Cabbage, and Potatoes; Noodles and Dumplings; Yeast Breads; Kolaches; Desserts; homemade wine and more.